This issue’s article is by James Glover who was convener of the recent Vedic Maths Conference in Bangkok. James has been teaching and researching Vedic Maths since 1980 and is the author of several books on the subject. Please see James Glover’s summary of the Bangkok Conference at the end of this newsletter. We hope to be able to give the full content of all the presentations at some point, but for now you can see the ten abstracts on the website. SWIS® (Success With Self), a not-for-profit registered trust involved in educational activities, has been conducting the ( Veda Ganitam the Amazing Mathematics) courses at different centers and schools in Hyderabad . Vegam course includes a VPL (Vegam Premier League) cricket match based on Vedic mathematics. Complete with Batting, Bowling, Fielding, Boundaries, Sixes, Bowled-out, Caught, Stumped and, in short, all the excitement and fun of a cricket match, VPL games are played with Vedic math as the base. Supported with interesting animated graphics of the cricketing action, the matches are a big draw not only with players but also with audience. 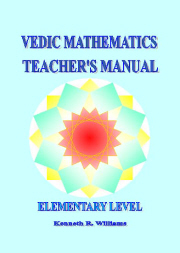 The Vedic Math, as taught in various popular courses including Vegam, is based on the seminal work of H.H. Swami Bharati Krishna Tirtha, former Sankaracharya of Puri. His path breaking work was published posthumously in 1965, which has inspired research all over the world. This year i.e 2015 marks the 50th anniversary of this amazing publication. To commemorate the Golden Jubilee a VPL tournament is being organized with participation of about 20 teams from reputed schools in Hyderabad (Government, Municipal, Public and other schools) to spread the awareness about Vedic Maths. Five day workshops, imparting knowledge of selected topics of Vedic math necessary for playing the VPL Matches at each school for nominated students of V, VI, VII and VIII classes are organized to select a school team (Unlike regular cricket, there are only 5 players in each team and the games are played in a unique T-20 format). Certificates, special gifts, trophies and gifts for players, Best Bowler, Best Batsman, Best Fielder, Person of the Match and Person of the Tournament, will be given. The winning team gets a team award of Rs.10000/- and the Trophy, Runners-up team, Rs.5000/-, Second Runner-up team Rs.3000/- and third Runner-up team Rs.2000/-. We are exploring ways and means to get the event telecast. Shri Siddharth Kak, famous TV personality (Of ‘Surabhi’ fame) and Chairman& Creative Producer, Cinema Vision India Ltd. has kindly consented to help in all aspects of the TV broadcast. We are looking forward to support and help in, sponsorship for the telecast, sponsors for the Souvenir (Rs.10000/- one full page) and Media publicity. Workshops in the schools and selection of school teams expected to be completed by second week of August. The quarter and semi-final games may be completed by end of August. The final match and the function where Prizes and Trophies are given away and the souvenir is unveiled by dignitaries, may be held in first half of September. Feel free to contact on Mob:+918297120080 (Harishh) or +91-40-27138854 for further information or clarifications. The next Introductory Certificate Course starts on 3rd August. ‘Multiplying Numbers with Different Bases’ by Sameer Mittal. This shows how to multiply numbers near different bases, whether above or below them. We have a new tab on the website: ‘Courses’. You can see the seven courses available and how they are related to one another in a single diagram. At the moment i teach Vedic Maths to a year-7 student in the UK. His name is Ramnik. I teach him for one hour every Saturday and Sunday at my home. Incidentally, his mum found my contact details from the Vedic Maths Tutors page on your website. I started taking Vedic Maths classes for Ramnik nearly 3 months ago from April 11 and he has improved in his maths grades at school which gives me a hope for continuing to teach Vedic Maths to him. Before taking the classes, his maths grade at school was 5c. He was given a target to achieve 6c in the final exam that happened last month. I am happy to inform you that Ramnik got a grade of 6b which was above his target level. The highest being 6a. His teacher at school praised him for achieving the higher grade of 6b. Ramnik has still continued with my weekend sessions even though his exams at school are over. ​That's to prepare for year-8 maths curriculum in advance for next year. My approach in teaching Ramnik is that i teach him a Vedic Maths Sutra and then ask him to practice the questions based on the Sutra from the website that's used by his school. The 16th World Sanskrit Conference was held in Bangkok from 28th June to 2nd July and featured a section on Vedic Mathematics chaired by James Glover. The ten papers featured a range of different aspects of Indian and Vedic mathematics and were well received. Within the next three months the papers will be published in the conference proceedings. This was an international conference, the largest of its kind, and is held every two to three years in different parts of the world. It was very useful to be able to present Vedic maths as a bona fide subject and this can only help with making it more accessible and acceptable. Here is a brief synopsis of each paper. Swati’s paper discusses the aim and challenges of integrating Vedic maths into a school curriculum. Through questionnaires sent out to various people engaged in teaching and learning Vedic maths the paper draws together and summarises current difficulties and successes experienced at the grass-roots level. Co-authored by James and Kenneth, this paper looks at the pedagogical advantages of Vedic maths. Using various examples it illustrates the flexibility, speed, development of strategy skills, creativity, improved understanding and unifying qualities of Vedic maths. Adapting Vedic Mathematics in modern technology and learning analytics; to enhance creativity and efficiency in Mathematics. Lokesh demonstrated his state of the art software application, Maths2Shine, that generates Math worksheets. Children attempt these worksheets and all their learning parameters are captured in real time in user-friendly software. The software also triggers collaboration between students, parents and teachers. The Magic of the last Digit takes Tirtha’s algorithm for extracting the cube roots of perfect cubes and extends it for higher powers. It reveals a wonderful pattern in the last digits of such numbers and explains why the pattern works. This highly detailed paper looks into how the Vedic method for converting fractions into decimals can be used to identify prime numbers and deepen our understanding of number theory. This succinct paper gives a broad sweep of some of the highlights of Indian mathematics through the centuries. Not just the highlights but also a collection of some of the most important concepts including, Pythagoras’ theorem, the value of Pi, decimal system, place value, numbers, zero, series, fractions, trigonometry, quadratics and binomial expansions. Vanishri’s paper is a research on the meaning and significance of geometrical shapes found in Mandalas and Yantras. These beautiful Mandalas form an essential part of rituals. Arvind has researched ancient Indian methods of multiplication, of which there are several, stretching over a period of more than 2000 years. He compares them with the Vedic mathematics methods given by Bharati Krishna Tirtha and shows that there are links. This paper takes one sutra, Vyashti Samashti, and investigates the breadth of mathematical meaning as well as the deeper significance in terms of psychological and spiritual meaning. This looks at the fast and easy methods of Tirthaji’s mathematics, highlighting its attractiveness, and some of the background to his work. The conference was a great success and it was so useful to meet up with like-minded enthusiasts face-to-face. Looking forward there are a number of possible developments such as research into the mathematics of the Kerala School of Mathematics, further research into developing Tirtha’s methods and seeing how the sutras apply to conventional mathematics. Given the success of this event we intend to organise similar conferences in the future and are looking into possibilities for holding one in Delhi next year.